Here's a simple card I love that I forgot to post. It's using the Hero Arts butterfly design for the Silhouette. It's the last time I'll use toothpicks behind this butterfly...I promise! See my other toothpick cards here and here. 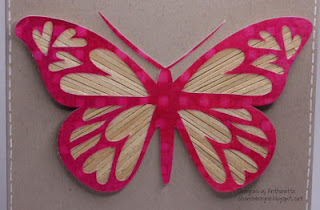 I cut the butterfly from the a sheet of digi paper from Cheery Glen by Misty Cato (Sweet Shoppe Designs). 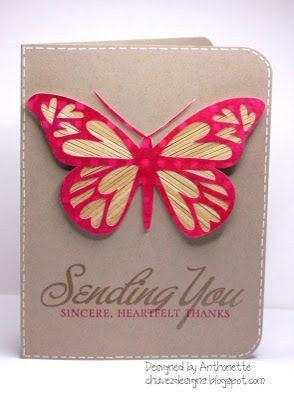 To give it some shine, I used VersaMark ink on the entire butterfly and embossed it with clear embossing powder. Sorry, you can't see the shine in my photos. 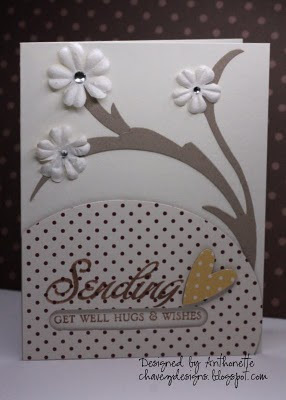 I also used the same ink and embossing powder on the "Sending You" part of the sentiment. Speaking of Sweet Shoppe Designs, I stepped down from the Hybrid Babes Design Team. I didn't have enough time to devote to the SSD community. I'll continue doing hybrid projects. Thanks, Jen, for the awesome inspiration to even try doing hybrid cards! Hi everyone! 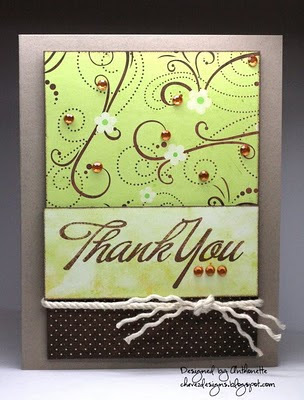 I'm back today as a guest designer for Inkspirations by Makeesha Byl. 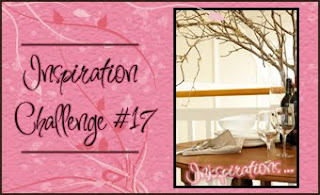 This week is Inspiration Challenge #17; a very lovely table setting. I was inspired mainly by the branches and the lovely vanilla, white, and kraft colors. The wine glasses in the photo inspired me to use rhinestones as flower centers. I used my Big Shot to cut "branches". Even though the inspiration photo doesn't have dots, I was drawn to this paper again. I cut the paper in a shape that reflects the table shape. I made this card for my Aunt Christine. I've mentioned her before. She was in the hospital last week because of pneumonia. She's been fighting a rare form of breast cancer (Inflammatory Breast Cancer) for a few years. During a PET Scan, they discovered that she had fractured a few ribs from the violent coughing. She'll also have to start some stronger chemo very soon. Inflammatory Breast Cancer is a strong enemy, my dears! I've been wanting to upload these pictures all week and here it's almost Friday. My non-crafting life is a little too busy. 3. Carol Duvall! I didn't meet her, but it was a thrill just to see her. Let me give you the back story as to why I was there. Back in December, Tina (Travelingmama) tweeted that she was coming to California for CHA. I replied that I would definitely have to consider attending. When else would I get a chance to meet her? She lived in Morocco up until December and is in the US visiting family until they move to Denmark in the Spring. It was an easy decision to make. Thanks Tina making the trip! I don't think I would've made the effort to attend otherwise. I also got to meet her beautiful mom and sister. I loved Ashley Cannon Newell's spontaneity. From one day to the next, she booked her trip to CA. We drove together from the Orange County airport to Anaheim. We actually met in the ladies room in the airport...funny! On Saturday I had a great lunch with Tina and Sankari. Loved these ladies! If you would like any of these individual pictures, let me know. I'd be happy to email it to you. Have a good one! Hi everyone. I flew back from Anaheim on Saturday night. I wish I could have stayed longer to attend the tradeshow part of CHA. I didn't get to see Jennifer McGuire, Lisa Spangler, or Julie Ebersole. I really wanted to meet them. Later today I'm going to post the pictures I took while I was there. The night before I flew out, I remembered I wanted to take some calling cards with me since I would be meeting a lot of familiar and new faces. I remembered these calling cards How About Orange featured last year. They are fabulous! I got a lot of compliments on them and I promised I would remind everyone I met where to get them. This free download was created by Cameron Blazer. I didn't notice until writing this post that she also has a multi-line version of the PDF file. You open up the PDF file type in your name and contact info just once and it gets replicated in the whole file. Just print on some nice cardstock (I used some HP Matte Brochure Paper) and trim. The cut lines are included to make that task easier. Thanks, Cameron! Hi everyone! I'm currently in Southern California for CHA, but I'm back again today as a guest designer for Inkspirations by Makeesha Byl. Keesh has been super busy over the last month with her major family move from one part of Australia to another, but she is back this week for a new Inkspirations Challenge. This week was a color challenge. I should've put this butterfly center and not tilted. Arrrgh! It bugs me now that I look at the photo. Whew...not enough time in the day! Today is my sister Leonel's birthday. I called her, but didn't send a card in time. Hope your day is going well. It's rained here every single day this week. 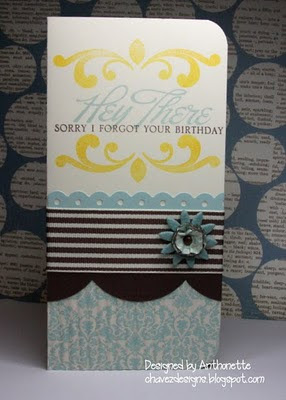 I made this card the other day, but wasn't able to get a picture with natural light. I'm packing and hoping to get to Anaheim safely tomorrow for CHA. I didn't make Dawn's deadline, but I used the colors from her Raspberry Suite Color Challenge #21. I'm looking forward to the next two days. 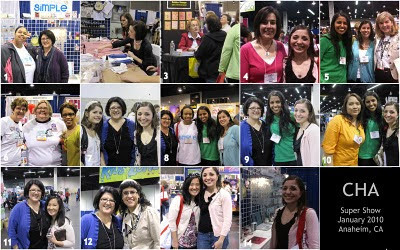 I hope to meet a lot of my favorite bloggers. Today, I was happily surprised when Ashley emailed and said she decided to attend CHA. We are both scheduled to arrive in Orange County with 2 minutes of each other. Fun, fun, fun! I love that Hero Arts has released some designs for the Silhouette! I've always loved this butterfly image, so now I can cut it with my Silhouette and I can make it as little or as small as I choose. Can you tell I love my Silhouette? I posted this card on Flickr last week for a Hero Arts challenge, but had forgotten to post it here. I glued individual toothpicks to the back of the image. Last month I loved the toothpick challenge for Everything But the Kitchen Sink, so I wanted to use toothpicks once again. I loved creating this card for their challenge. 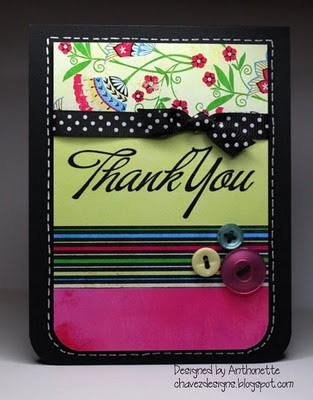 The card stock and sentiment is from Stampin' Up and the patterned paper is a digi paper design called Cheery Glen by Misty Cato (Sweet Shoppe Designs). Thanks for stopping by! It is a very rainy Martin Luther King, Jr. day. I'm listening to his speech right now on YouTube. My son said he's very glad that he was born after the famous speech. I asked him what he meant. He said that he's glad he's lives in a world that was made better by Dr. King. What a great perspective from a 6-year old. Four more days before flying down to attend CHA! Hope you had a great Saturday. I made this little gift card in a rush this afternoon to get to a birthday party for one of Kalino's favorite friends, Nico. I didn't have time to measure the card, but the final size was about 3x4 inches. I love the Lots of Bots stamp set! 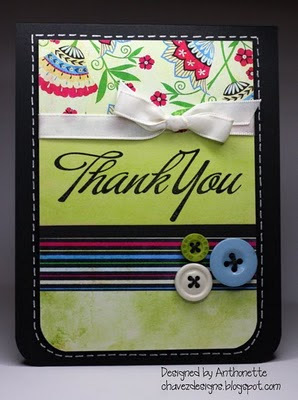 I used these fantastic cards Mary created as my inspiration. I used an Aqua Painter to color the image. I used a white gel pen on the eyes. I shouldn't have done that; it didn't need it. Hello my dear paper crafting friends. 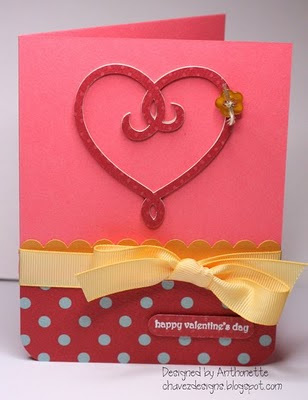 I made this card for Embellish Magazine's Color Challenge. We also had to use hearts on the project. The colors we had to use were red, black, and pink. We could also use some white. 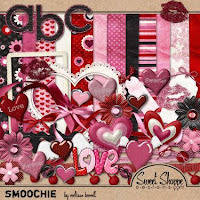 I used some digi papers called Smoochie by Melissa Bennett from Sweet Shoppe Designs. I've got to get some sleep. I've been up since 4 AM! The little guy had a nightmare and came to our room. I couldn't fall asleep, so I decided to go downstairs to sleep on the couch. As soon as I opened our bedroom door, I was hit with the smell of skunk. Ugh! It wasn't over-powering, but I couldn't fall asleep. I was worried a skunk was under the house. We live in the suburbs, but I feel like I live in the mountains. Two nights ago when I was putting some recycling in our large bin in the backyard, I saw the reflection in two little eyes looking at me from the edge of the deck. It was a darn raccoon. Then I saw another....and then another one! They were large. I was telling them (actually yelling) to get out of my yard, but I don't speak "raccoon". One of them kind of hissed at me. They are scary critters. Almost every year, they break the vents of the crawl space and try to live under our house. I bet these 3 critters caused the skunk to stink up the neighborhood. Hola Paper Crafters! 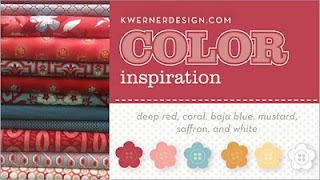 I made this card for Kristina's Color Inspiration Challenge #57. I really struggled with the design of this card. I tried so many different layouts. I worked late at school today, so I missed Kristina's deadline by about 5 minutes. Oh well, here it is anyway. I created the focal point of the card with my Silhouette. 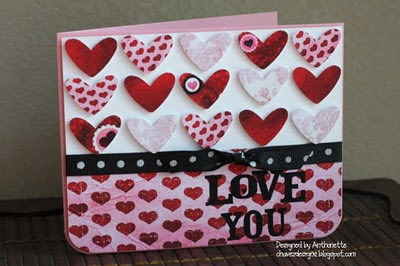 I cut this heart design 5 times (4 of them in kraft cardstock and 1 of them in designer paper). I glued all the layers together to make my own chipboard. I love doing that! I attached a button with some twine. 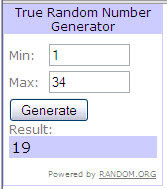 The rest of the card is pretty simple. I'm going to CHA in Anaheim next week! I look forward to 2 days of crafting fun. For me, it's only a little over 1 hour flight. Once Tina (Travelingmama) said she was going, I told her I would definitely have to go. I mean she's in the US all the way from Morocco! Several other talented designers will also be there (Sankari, Kelly Marie, Amy Tsuruta, and Courtney Baker). I would love to meet Jennifer McGuire and Lisa Spangler from Hero Arts. Allison Kreft Abad from Hambly Screen Prints will also be there. I've met Allison before, but I definitely want to do the Hambly make-n-takes. Are you going to CHA? If so, let me know. Thanks for stopping by. I hope you are having a great day. Happy Wednesday, everyone! My morning didn't start out very well, but I had a nice afternoon. Feliz dia del los Reyes Magos to those of you who celebrate. I'm back today with two more hybrid cards I made using the Cheery Glen by Misty Cato digi papers and my new Papertrey Ink set, Big & Bold Wishes. I still have many more thank you cards to make. I used skinny strips of cardstock to thread the buttons. I love that technique! 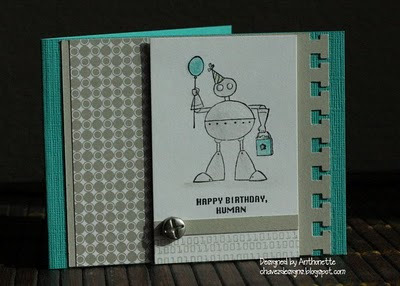 Stamps: Big & Bold Wishes (PTI) Thanks, Courtney! Hi everyone! I hope your January day is going well, whether you live a brutal cold climate or in the warmth of the southern hemisphere. I'm drinking some hot tea to take the chill away from this cooler California night. 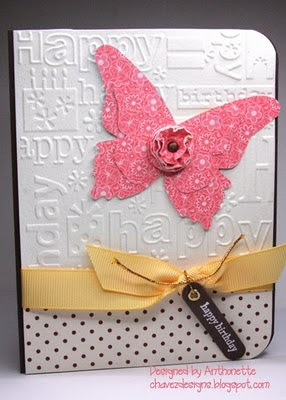 Here's a hybrid card using some great digi papers from Sweet Shoppe Designs called Cheery Glen by Misty Cato. These papers are awesome! I've got more cards to show you using this pack. 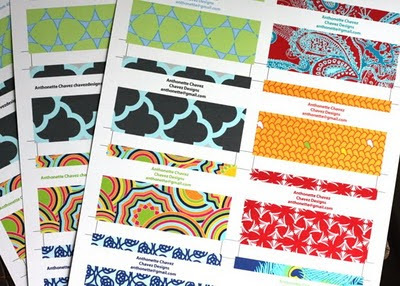 It's a very versatile set with a variety of colors and patterns. I also got to use some new Papertrey Ink goodies. 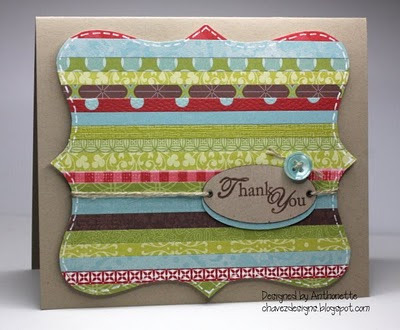 The Thank You stamp is from the Big & Bold Wishes set by Papertrey Ink. I won this set from Courtney Baker for this card I created that incorporated toothpicks. That was a fun challenge. Thanks, Courtney! Lisa, contact me with your mailing address. Thanks, everyone! Did You Know? And a Little Reminder. Here's a cool video that my husband sent to me. Makes you think. Just a reminder, you only have a few hours left to sign up for the Hambly blog candy on my blog. Have a good one! The weekend is over. I'm always a little sad about that. Tomorrow it's back to the regular routine of getting up early, making breakfast for the little guy, packing his lunch, and walking to school by 8:30AM. This week I'm focusing on making thank you cards for all our Christmas blessings. Family and friends have been so kind. After creating my Christmas cards, I had a lot of strips of paper left over. 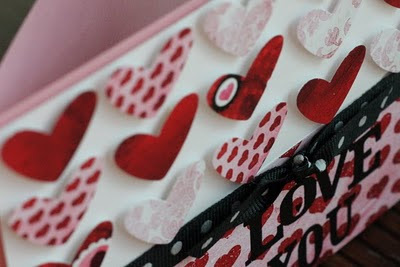 You know, the strip of paper leftover when you use an edge punch, like the scalloped edge punch. I had already glued the strips down to this shape I cut with my Silhouette, when I saw Nichole mentioned her Scrap-tastic challenge for her senior design team. I really like the card. I have other Scrap-tastic cards to finish up. Thanks for stopping by!